There are things at work that our co-workers do that we don't always agree with or we wonder is that who they are at home. And of course they do things that bug us. It happens in every work place. We have a cleaning service that comes on Mondays and cleans our offices and takes out the trash and we also have someone else who comes on Thursdays and empties the trash. Well, he was out this week. By the end of the week the trash was full and over flowing. 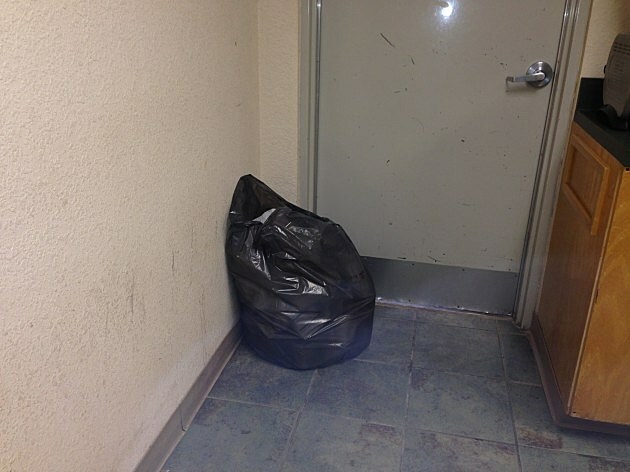 Instead of taking the trash out to the dumpster someone took it out of the trash can and left it by the back door. They didn't even put a bag back in the the trash can and put it back in it's place. Really? 10 more feet and the trash could have been in the dumpster.